Kelly Schmidtke is the winner of this year’s Kitchener Sports Association Volunteer of the Year Award for the KW Sertoma Speed Skating Club. She was honored with this award on November 17th in Kitchener. Congratulations Kelly on a job well done! Here’s Kelly’s bio for the award. Kelly has been with the KW Sertoma Speed Skating Club for 10 years helping out as a Volunteer in various capacities. She joined the Executive Board 3 years ago and is currently the Communications and E-Media Director. Kelly was instrumental in developing the Club’s Communication Policy, building a new website, and getting the Club active on social media. She handles all communications for the Club and is always looking for ways to promote speed skating. Kelly also Volunteers for the Ontario Speed Skating Association as an official at competitions across the Province and was awarded a Level II timers certificate earlier this year. Above all, Kelly is a proud parent of 2 speed skating daughters and can always be found at rink side supporting the skaters. 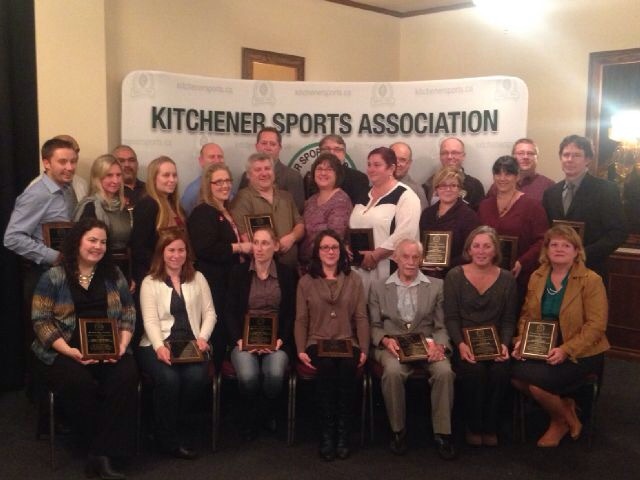 Kelly Schmidtke, front row far left, with the other award winners at the KSA banquet November 17th.